With Valentine’s Day around the corner, the 2019 “Mastercard Love Index” has revealed that Asians are spending 33% more on their Valentine than in 2016. 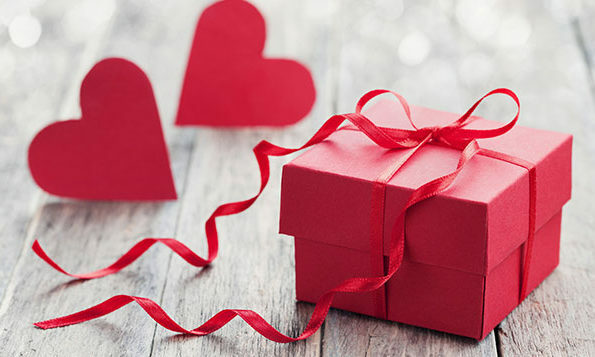 Asia Pacific leads the world in sentimental spending for Valentine’s Day, as the total spend during the Valentine’s Day period has risen by 33% since 2016, with the overall number of transactions up 37%. This is in comparison to US, where sentimental spending dropped by 8% during the same time period. About 29% of Asians were said to have waited until the last minute to buy a gift. However, according to the report, the lack of planning has not impacted Chinese consumers, where 40% of purchases took place on 12 February. Last-minute gift purchases may also account for the fact that more Asians still purchase their gifts in person (86%) rather than online (10%), the report said. The report highlighted that the share of contactless transactions increased by 60%, and the value of these transactions increased by 63%. It also saw a 32% increase in the number of eCommerce transactions between the 2016 Valentine’s Day period and the same period in 2018. Meanwhile, Asians still believe the way to a loved one’s heart is through their stomachs. In 2018, 68% of all Valentine’s transactions were made in restaurants. This also represents a 41% increase in transaction numbers made in restaurants over the past three years. In India, the restaurant spending was increased by 54% in 2018. In addition, transactions in transportation saw an increase of 25% in 2018, accounting for 24% of total spend during the Valentine’s Day period. The data also shows the number of transactions on hotel accommodation rose by 27% in China and India, while hotel transactions increased by 142% and 73% respectively. While most Asians continue to spend on transportation, Philippines recorded a 164% increase in 2018, while Australians bucked the trend by recording a 66% decrease in the number of transactions. The report also said that there has been growth in spending on classic gifts, such as flower bouquets and jewelry. In Asia, overall spend on flowers increased by 89% in 2018 compared to 2016, and jewelry transactions increased by 32% since 2016. 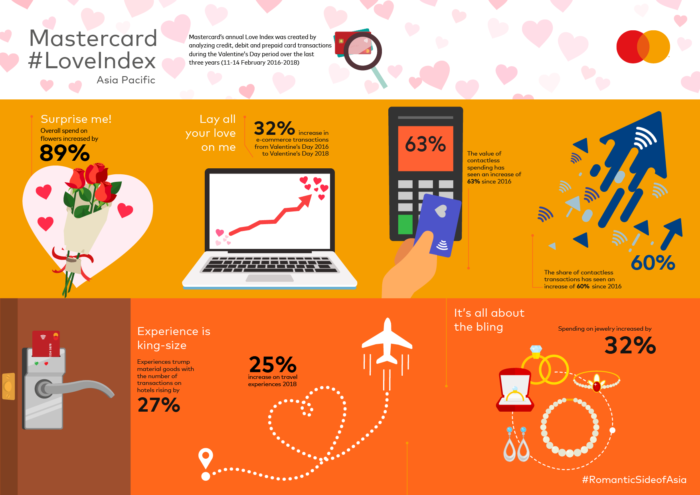 The annual “Mastercard Love Index” report was created by analysing credit, debit and prepaid card transactions over a three-year period, between 11-14 February, 2016-2018. Sentimental spending represents all spending during this Valentine’s Day period in the categories such as restaurants, hotels, transportation, books and records, jewelry and stationery. The campaign will showcase local efforts to end violence against women through the hashtag #16DaysSG. ..